Paul Collingwood is rated 50-50 to be fit for the third Test against South Africa in Cape Town, after testing out his injured left index finger for the first time since he dislocated it during practice prior to the fourth day's play at Durban. If Collingwood doesn't recover in time Michael Carberry, the Hampshire left-hander, is the likely replacement and would make his debut just four days after arriving from the UK. However, England coach Andy Flower remains optimistic that Collingwood will be available after he managed a more extensive work-out than had been planned during the nets session at Newlands. "He did more today than I thought he'd do," Flower said. "I told him to take it easy, and we'd test it out properly tomorrow. He had a net, did some fielding and a bit of slip-catching and his finger felt better than he thought it might. That's positive news, but we'll do a final fitness test on him tomorrow. I'd say at the moment it's probably 50-50." 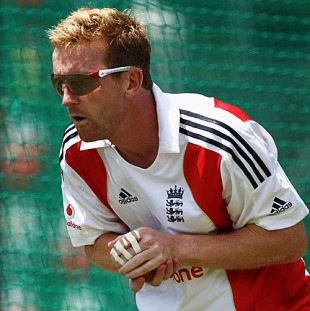 Collingwood has been one of England's in-form players throughout the tour and was named Man of the Series for the one-day internationals. In the Tests he made 91 at Durban to follow his match-saving 26 off 99 balls at Centurion, where he also contributed 50 in the first innings. After a poor finish to the Ashes series, Collingwood's place was coming under scrutiny, but the management forced him to rest for a couple of ODIs against Australia and he returned revived. He was outstanding during the Champions Trophy, proving a revelation with his previously unseen powers of six-hitting in the middle order, and has since carried that form forward. He will be tough to replace. "What Collingwood has done recently is he's used to good effect some of the vast amount of experience he's got over the last six or seven years," Flower said. "He's repaying England for all that investment in him. If he goes out, we'll lose some of that experience. "But you gain in another way if the debutant comes in and kicks off his international career. We're not worried. If he can't play, he can't play. We'll get on with it. Carberry was part of the England Performance Programme based in Pretoria until shortly before Christmas where he scored a hundred against a Gauteng team. There also remains the option of drafting in Luke Wright, but he has slipped down the pecking order after England's successful policy of playing six frontline batsmen. "He's [Carberry] been scoring runs out here in South Africa, so we're quite comfortable with that situation," Flower said. "The way he batted in the nets this morning, I'd feel very confident when he strode out to the middle. The allrounder option is always there, has been for the first two Tests and is again for this one. Flower's opposite number, Mickey Arthur, has been doing some hasty research on Carberry in case he makes his debut on Sunday but added Collingwood will be tough to replace. "I've done my homework on Carberry last night," he said. "If he plays we have had a look at him. He looks a very good player, very leg side and tries to score there a lot. "Collingwood has been instrumental, he has played unbelievably well through the whole tour. He's almost the heartbeat in the middle order and it will be a loss. But England have played some very good cricket so I'm sure they are comfortable that they won't weaken their team." Although England's starting XI remains uncertain, one message coming from Flower is crystal clear. The team won't be getting carried away after Durban. It's the message he - and Andrew Strauss - preached after the Ashes and despite the crushing nature of the victory two days ago nothing has changed. "It was a confidence-building performance in Durban," Flower said in typically understated fashion. "Our bowlers did a good job again. It was nice to see some of the batsmen go on to substantial scores. That changed the momentum of the game. "All round, it was a great performance from our side. We're one up - a great position to be in - but we're only halfway through a Test series. That means there's a lot of hard work to do in this Cape Town Test. But I know that our guys are looking forward to the challenge of taking South Africa on here. "I think the guys' feet are firmly on the ground. We reflected well on the Durban victory, but now they've drawn a line under that."